Live presented on February 28 at the Theaterhaus Stuttgart. Places 4 to 6 do not have to hide either and can look forward to 1 million Euro annual lottery tickets of Aktion Mensch. Six young scientists took the over 400 spectators in the sold out Theaterhaus in ten-minutes lectures on a journey into the wondrous world of quanta. Not an easy task for the slammers. Even experts in the field describe quantum theory as incomprehensible or, like Max Born, as "hopeless mess". Show master Jannis Pfau therefore freed the audience from the pressure to understand quantum physics by the end of the evening. After all, the slammers wouldn't understand quantum physics either, but at least they would have tried longer than most, he comforts. After six exciting lectures, the audience was spoilt for choice as to who was allowed to take home the winning prizes of 1,000, 500 and 250 Euros or 'Aktion Mensch' lottery tickets for the most illuminating and entertaining contributions. Love always wins in the end. At least that's how the people in the hall saw it and chose Charles Babin, Bretone with a fresh French accent and a doctoral student at the University of Stuttgart, as the winner of the evening. "Love between photons is deeper than love between people", Babin explains to us the amorous relationships between his photon friends Leon, Manon and Anton and, by the way, quantum phenomena such as entanglement, measurement and teleportation. In his slam, second-placed Alexander Blech explained what a look in the mirror can mean in science and why his dislike of caraway drove him into physics. Blech, a PhD student at the University of Kassel, is researching chirality. If the theories from quantum control could already be put into practice experimentally, it would seem that substances as different as caraway and mint, whose molecules are very similar in mirror image, could "very easily" be converted into each other. In 3rd place, the audience voted for the quantum mechanics interpretations of Thomas Bissinger, PhD student at the University of Constance. His recommendation for more variety in the children's room: quantum balls made of electrons. They only obey probability, exact positioning is impossible. This has been challenging scientists for almost 100 years now. Albert Einstein was sure that "God does not play dice". Bissinger took the audience on a search and presented the most important ideas and their weaknesses. Muamera Basic, the youngest slammer of the evening and master student at the University of Stuttgart, invited the audience to her Photon Crystal Club to present her research. Flirt tips for her selected protagonists - a rubidium atom and a photon with a wavelength of 780 nanometers - were included. A perfect dance couple at first sight, but not yet coupled. A chill lounge provides the right atmosphere, where atom and photon can interact longer than usual. The physicist may call the Rabi oscillation, all others call it 'falling in love'. Can we believe the advertising promise that sells us water untouched since the ice age? Slammer Lisa Ringena, PhD student at the University of Heidelberg, is researching how to determine the age of water. In the laboratory, Ringena has only targeted the rarest specimen in the water - argon 39. This isotope is not only rare, but also fast. Finding what you are looking for is less likely than winning the lottery and slowing down is hopeless? Not at all. Ringena's secret weapon - a laser and the rules of quantum physics at the atomic level. Hüseyin Vural, a PhD student at the University of Stuttgart, is also researching photons. He listens very carefully to what the photons have to say to him. For the classic double slit experiment, his photons go to school and learn English or German. His detectors immediately recognize whether they are detecting a German or English speaking photon, but behind the double slit they see only a confusion of languages. The pattern on the screen can capture Vural mathematically, but not even that helps him understand the single photon. Before the award ceremony the audience could relax and listen to the haunting sounds of the Küting-Nestel-Küting Percussion Trio. Sebastian Schikora made the sounds of the musicians visible for everyone in a water wave experiment that was projected to the screen. "The winners of the evening were all six slammers at the end", the organizers Karin Otter and Mahdieh Schmidt agree. All of them took up the challenge and presented entertaining excerpts of current research topics to the audience. For the young slammers it was often the first time that they stood in the spotlight in front of a large audience to explain their passion for their research topics. In preparation for the Q-Science Slam, young scientists were invited to apply for a place at the IQST-Workshop for Science Communication. Berlin screenwriter and dramaturg Oliver Schmaering and Stuttgart voice coach and news anchor Caro Mendelski provided the slammers with the right tools for a successful slam. "The exercises of self-presentation, rhetoric and dramaturgy are the best preparation for students and scientists who are later or already now lecturers or lecturers at conferences in front of an audience," adds Tilman Pfau, spokesperson of the Center for Integrated Quantum Science and Technologies, IQST. 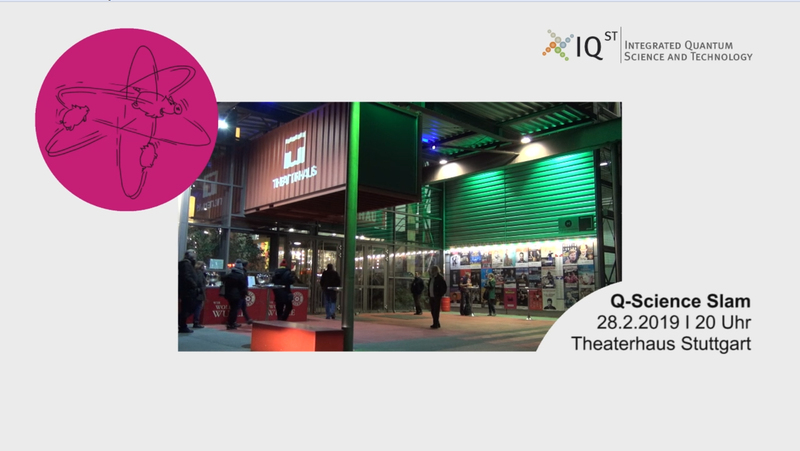 Those who missed the Q-Science Slam live and are now curious will soon find the film clips on the YouTube channel of the University of Stuttgart and on IQST.